The looming depletion of non-renewable resources has increased the global land grab in the past decade. So far however, the question of how and when people can influence economic outcomes has received little attention in the study of social movements. 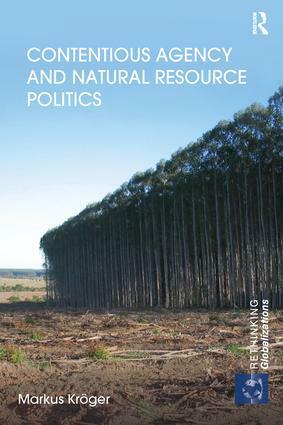 Based on in-depth ethnographic field research since 2003 in the industrial forestry expansion frontiers in Brazil and elsewhere in the global South, this book presents a novel theory to explain how the interaction between resistance, companies and the state determines investment outcomes. The promotion of contentious agency by organizing and politicizing, campaigning, protesting, networking and engaging in state and corporate-remediated politics whilst maintaining autonomy is central to explaining how impacted people influence resource flows, and block or slow projects they deem harmful to their livelihoods and the environment. The conflicts between globalizing paper and pulp corporations and the landless peasants, indigenous communities and other parties with alternative projects for the planet’s future are studied to illustrate how a great transformation can be built upon progressive counter-movements. This systematic comparison of several cases illustrates the broader principles and problems endemic to the global political economy. Contentious Agency and Natural Resource Politics will be of strong interest to students and scholars of international relations, international political economy, environmental studies, environmental politics, sociology and social movement studies.